Most of the time I am quite happy to eat Thai food and don't really feel any "need" for good old English cuisine. Maybe a full English breakfast once every few months, maybe a roast dinner once a year, but most days I am happy with local food - I mean, Thai food IS very good. I'm not bored with it after years here. A couple of weeks ago I met Steve, who has a little business called "The Shires Pie Company". He brought me a few samples of pies and bread - great bread! Even my wife, who normally doesn't eat bread, was impressed and now steals bites of my morning toast. We dropped by Steve's house last week to get more bread and also bought a couple of pork pies and a scotch egg - yep, he makes all that and more! The house is full of ovens and fridges, and Steve and his wife spend all day baking. He's making food for a few restaurants now and generally only makes to order. Anyway, Pickled Onions.... now there's something I confess to missing. Steve called me yesterday and said he had some ready. Despite the rain, I called in on the way home and have enjoyed munching away on a few already. Now need a pork pie to go with them! If you are in Phuket and want some English pies or pickled onions or bread or scotch eggs or sausage rolls... just leave your email here and I can send you Steve's phone number. Good food! 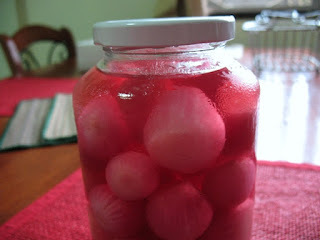 (above) Pickled Onions - Aroy Mak Mak! This festival is addictive! Last year I went to see one street procession, this year 2 processions - next year, I need more! This is something special, not some tourist show, not some fake Thai copy. This is all very real. 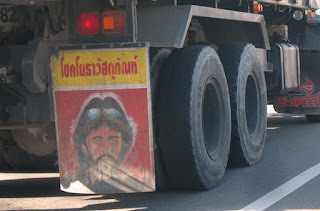 I see these 2 faces all over the place on the mudflaps (mud guards / splash guards) of large trucks in Phuket. 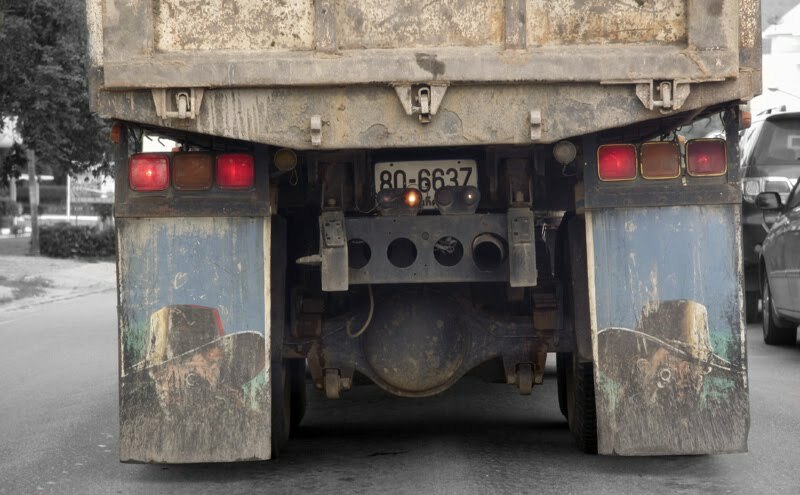 My wife reckons the bearded one is Al Pacino. Could be.... see the photos below. I reckon they look like the Bee Gees, though. 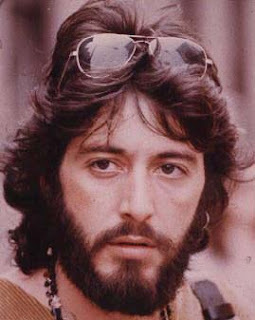 above: Barry Gibb or Al Pacino? 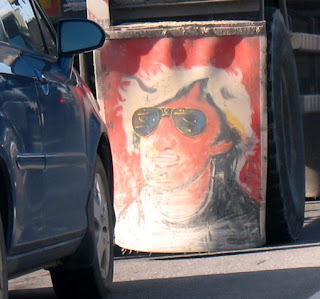 above: Robin Gibb? Or .. I have no idea! "I sometimes consider moving back to the UK on the basis of the beer alone but memories of the insane levels of taxation, traffic, laws, regulations and all the other crap always manage to bring me back to my senses." It's true, the beer in Thailand is not very good. I tend to drink Chang, which is cheap and has some flavour. But in general, it's all rather poor lager. Just found last week that Nikitas Bar in Rawai beach is selling Beer Lao, which I had not tried before - hey, not bad at all! I can recommend Nikitas - on the beach, quiet, relaxed. 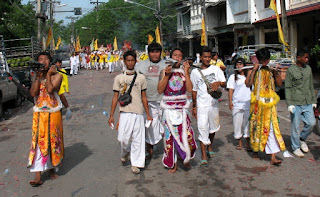 This week is the Phuket Vegetarian Festival. I have been eating the Jae food as much as possible the last few days but had to wash it down with a few beers! Will try this week up to the end of the festival to stay dry. Well, I did not watch on TV, as I think it was on something like 2am local time, but was scouring the TV news this morning to get the score.... France 9 England 14. After appearing to be rather crap in the first couple of games, England have now beaten Australia and France and head to the final next week to defend the World Cup. I have a feeling it will be against South Africa, and I have a feeling England will get walloped, but that's just good old English pessimism. Yes, its veggie time again. Today was the first day and I have been eating the "Jae" food in an attempt to purify my body. The food is not bad, though you have to search hard for some variety or end up eating spring rolls for 9 days. We just went to Kathu Village this evening, but will try some place in town tomorrow. I'll keep up with the festival on my blog - Jamie's Phuket.